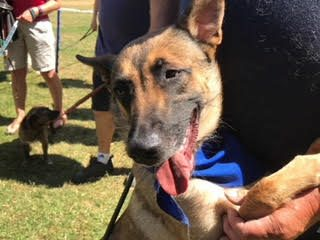 Three year old Kay is a Belgian Malinois. She is a loving girl who enjoyed herself at our dog show recently. She was fine with all the other dogs and people around her. She enjoyed a cuddle from our Adoption Officer as you can see from her photo. Kay can sit when commanded and walks nicely on the lead. She can be uncertain around men on first meeting and needs time to be reassured. Kay could live in a home with older children.